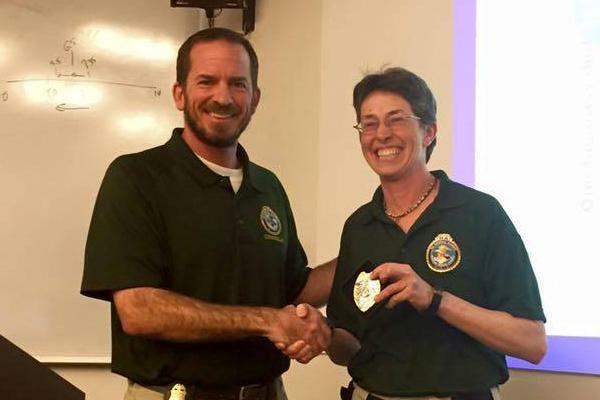 Jennifer Shockley (right) resigned on Jan. 25 from the Unalaska Department of Public Safety. Her last day on the job will be Feb. 24. Shockley declined to comment on why she was looking for something new. But as a former Peace Corps volunteer in the central African country of Cameroon, she said she's excited for another chance to work overseas. She'll be based in Monrovia, Liberia as a contractor with the U.S. State Department. "It's something I'm really, really looking forward to," she said. "They already have a police force that's extant, but it needs a lot of mentoring and some guidance to get their systems up where they want them to be. It should be very neat." Shockley's last day as Unalaska's acting police chief will be Feb. 24. She has held that position since last winter, when Mike Holman retired as director of the Department of Public Safety (DPS). In that time, DPS has been at the center of heated debates amongst city officials and community members over department structure, employee morale, and staff recruitment and retention. Shockley declined to comment on who might replace her. She said the city is still figuring out how to handle the transition, but she expects nonessential projects to be put on hold. "Staffing at the department is pretty low, and how those things will be divvied up remains to be seen," she said. "The reality is that some of them will probably just be put in abeyance until staffing is higher. Our patrol staff have a full-time job just maintaining minimum staffing for calls for service for the community." Shockley said she "cares deeply" about Unalaska and has mixed feelings about her decision to leave. She moved to the island almost 30 years ago, working first as a fisheries observer before joining DPS. "It's a great place to live," she said. "I'm not selling my house. Unalaska is my home, and I will be back. So I'd like to tell people who might be waving goodbye as if they're never going to see me again that I will actually be back, for better or for worse. It's been — for the most part — a really good career here." Jennifer Shockley submitted her letter of resignation Friday morning after accepting a job in Monrovia, Liberia as an advisor to the Liberian national police. Shockley previously served as a Peace Corps volunteer in Cameroon in central Africa. She moved to Unalaska almost 30 years ago, working first as a fisheries observer before joining the Department of Public Safety. Shockley has served as acting police chief and Public Safety director since the Jan. 2018 retirement of Mike Holman. In that time, the department has been at the center of heated debates amongst city officials and community members. Last month, the City Council voted to split Public Safety into two standalone departments: one for fire and emergency medical services, and another for police, corrections, and dispatch. Shockley's last day will be Feb. 24. Starting next month, Deputy Police Chief Jennifer Shockley will serve as acting director of the Unalaska Department of Public Safety. City officials made the announcement Tuesday. They've selected Shockley to hold the top job while they search for a full-time replacement for outgoing director Mike Holman. It's unclear how long that search will last. But as an 18-year veteran of the department, Shockley said she's interested in the permanent position. Why Does Unalaska Struggle To Recruit And Retain Police? A new police officer was sworn in at Tuesday's City Council meeting, but even with his addition the patrol division is just over half staffed. According to Acting Police Chief Jennifer Shockley there are six vacant police officer positions as well as the permanent police chief role. There are no vacancies in corrections or communications. Why is it so hard to keep the department staffed? Shockley says nationwide interest in public safety services – especially law enforcement careers – is at an all-time low. The City Council is sticking with its decision to split the Unalaska Department of Public Safety. The split creates two new standalone departments: one for fire and emergency medical services, and another for police, corrections, and dispatch. The legislation also retires the position of public safety director/police chief for one police chief and one fire chief – both responsible for running their own departments and both reporting to the city manager. But Thursday, Vice Mayor Dennis Robinson requested the council reevaluate. Unalaska's Department of Public Safety has been the one-stop shop for local law enforcement for about five decades. Now, after years of debate, the consolidated organization seems to be on the verge of a restructuring. Legislation to split Unalaska's Department of Public Safety is moving forward, despite the fact that city officials remain deeply divided over the issue. This week, City Manager Thomas E. Thomas presented the City Council with an ordinance that would separate Public Safety into two standalone departments: one for fire and emergency medical services, and another for police, corrections, and dispatch. Unalaska should split its Department of Public Safety to create a standalone fire department separate from the police force. At least, that's the recommendation City Manager Thomas E. Thomas made to the City Council on Tuesday, hoping to settle a longstanding debate over how to improve retention and morale. Thomas said putting the fire chief on equal footing with the police chief will be "critical" for the future success of the fire division — and his ability to oversee it. Almost six months ago, the Unalaska City Council agreed to suspend the search for a new director of public safety. The plan was to wait until councilors had settled a longtime debate over restructuring the department and its leadership team. Now, Vice Mayor Dennis Robinson said they've been on hold for too long. After months of indecision, the Unalaska City Council has finally reached a consensus over restructuring the Department of Public Safety: They’ve agreed to shelve the matter until a new city manager is hired. The unanimous decision came Tuesday at the urging of Interim City Manager Nancy Peterson. Despite months of debate, the fate of Unalaska’s fire division is far from decided. The Unalaska City Council showed no consensus Tuesday, when city officials proposed restructuring the Department of Public Safety to put fire on equal footing with police. Right now, the fire chief reports to Mike Holman, police chief and director of public safety, rather than having a direct line to the city manager. He also needs Holman’s approval on his budget. Is it time for Unalaska’s firefighters to have their own department — separate from the police force? Or should both divisions continue living under the consolidated Department of Public Safety? Those questions sparked heated discussion at Tuesday's City Council meeting. “The fire department is in crisis mode now, and it’s been that way for years," said City Councilor Dave Gregory.